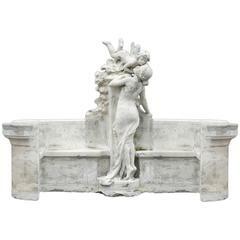 Impressive continental weathered green patinated bronze figural fountain. A single cherub sitting on a shell form sleigh holding a fish in one hand. 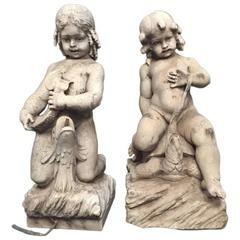 Two pairs of sitting cherubs with a rope holding two horses on either side of them, supported by 3 curved fish on a basin decorated with an egg and dart edge motif, resting on a scalloped round pedestal base with acanthus. Beautiful attention has been given to every detail of the naturalism.